The Employee Retirement Income Security Act (ERISA) requires plan sponsors to act prudently when making decisions relating to the management or administration of the plan. These “fiduciary functions” must be performed solely in the interests of plan participants and beneficiaries, with the exclusive purpose of providing benefits, while defraying reasonable expenses. In addition, when it comes to selecting investment options, plan fiduciaries have a duty to diversify investments and defray reasonable expenses. There is a measure contained in section 404(a)(1)(B) of ERISA that requires the fiduciary of a defined contribution retirement plan to use “care, skill, prudence and diligence”, and to act in the same way that someone “familiar with such matters” would act. The “familiar with such matters” language has often been interpreted to mean “expert”. This language creates an important distinction from earlier prudent person guidelines, in that it holds fiduciaries to a stricter standard. A lack of familiarity with investments will not be excused as a reason for not fulfilling fiduciary duties. If fiduciaries are unsure what to do, they are encouraged to retain professional advisors to make recommendations. Advisors can take many forms and offer different types of fiduciary support. ERISA permits plan fiduciaries to delegate day-to-day responsibility for selecting all or a portion of the plan’s investments to an “investment manager.” If properly appointed and monitored, the fiduciaries will not be liable for managing those investments over which the investment manager exercises discretion. In addition to the liability protection offered, fiduciaries are looking for ways to reduce work and cost on their plan. An effective investment manager can help outsource the day-to-day employer duties and responsibilities, and make sure that investments lineups are cost-effective, prudent, diversified, and competitive. 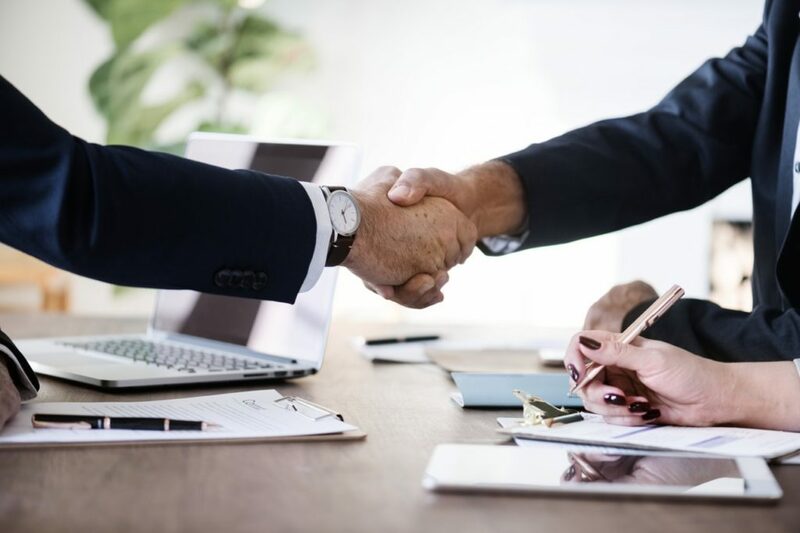 When plan fiduciaries decide to hire a third-party professional advisor to assist with investment decisions, they generally have three types to choose from; Consultants, Investment Advisors, and Investment Managers. Each type provides different services and assumes a different level of fiduciary liability. Assumes no fiduciary liability for investment recommendations. Hiring a consultant helps to mitigate risk because it demonstrates plan sponsors have taken that extra step to contribute to a deliberative process. However, because consultants do not have discretionary authority and are not plan fiduciaries, the plan sponsor retains full fiduciary responsibility. Assumes a co-fiduciary liability. Has a fiduciary responsibility to deliver prudent investment advice consistent with ERISA’s fiduciary standards. While an investment advisor is liable for the investment advice they provide, the plan sponsor retains the ultimate decision-making power over plan assets. That said, the plan sponsor is not relieved of fiduciary liability for selecting and monitoring the plan’s investment options. Assumes sole fiduciary liability for investment selection and monitoring. Hiring an investment manager offers the plan sponsor the greatest outsourcing of work and protection from claims related to poor investment selection and monitoring decisions. The plan sponsor’s liability is limited to selecting and monitoring the investment manager. If you make the decision to engage a 3(38) investment manager, there are a number of considerations you will need to document to ensure you have effectively delegated your duties. First, it is important to understand that the fiduciary protection provided to a plan sponsor who utilizes an investment manager is not absolute. The plan sponsor is still responsible for prudently selecting and monitoring the investment manager. Accordingly, the sponsor must select an investment manager prudently, taking into account the manager’s qualifications and all other relevant factors. Investment managers require a specialized understanding of retirement plan rules to meet their fiduciary obligations under ERISA. An investment manager’s understanding of ERISA, and additional services and experience to qualified plans may be more important than investment experience or past performance. Not all investment managers offer the same services. Some offer plan-level and participant level services while others offer plan-level or participant-level services. Plan-level services include Investment Policy Statement (IPS) preparation, fund selection and monitoring, and ERISA 404(c) assistance while participant-level services include model portfolios and investment education. Is the investment manager a bank, registered investment advisor or insurance company? Does the investment manager acknowledge his/her fiduciary status in the contract with the plan, and are the other terms reasonable? Does the investment manager have the requisite background, experience and/or insurance to perform the services? Is the investment manager properly licensed and in good standing? How is the investment manager compensated, and does that present any conflicts of interests? Is the value provided reasonable in light of compensation received by the investment manager? Are participants satisfied with the services provided? It is also important to consider what functions the investment manager may not be willing or able to perform. Often, the manager’s services may be provided remotely and/or limited to managing the plan’s DIAs, QDIAs and/or participants’ accounts. 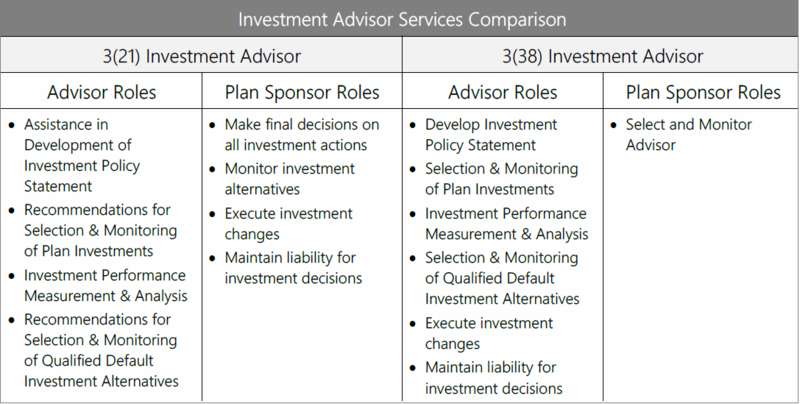 In these cases, it may still be necessary to engage a plan advisor or consultant to help with other aspects of the plan (i.e., providing advice or education to participants directly, helping the fiduciaries select and monitor the plan’s service providers, including the investment manager, etc. ).